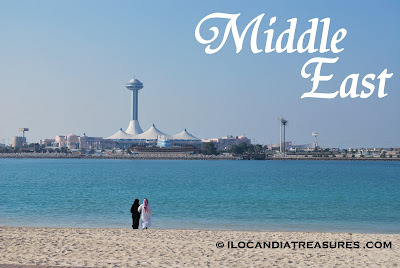 It is unbelievable that with a total fare of P8,000.00 I was able to go to the Middle East. Lucky me that I got a very cheap promo fare from Air Asia which I booked three months in advance and that rate was already a roundtrip ticket. The only thing is that it was not a direct flight. I made connecting flights from Clark to Kota Kinabalu to Kuala Lumpur and to Abu Dhabi. It was long but nevertheless it was a fun trip. Entering into the Arab world was an opening salvo for another great year of travels. Middle East was another experience to treasure and to share to everyone. I spent a total of 14 days visiting United Arab Emirates with highlights of visit to Sheik Zayed Mosque in Abu Dhabi where I was hosted by my former college classmate Juliet. Then a visit to Burj Khalifa, the newest tallest skyscraper in the world and a desert safari in Dubai where I was hosted by my friend Franie. I had a short stopover in Kuwait where at least I got a glimpse of what the country looks like. And of course my visit to Jordan was exciting of all because I stayed in a hostel where it was so fun to stay at. I met so many backpackers. I love the people of Jordan. They were so kind and friendly. I visited the main treasure of Jordan, one of the Seven Wonders of the World, that is Petra. It was so stunning. This adventure was definitely amazing. The year 2009 was a great year that passed. It was a year of wonderful surprises. Travels were big in this year since I was able to visit different countries. 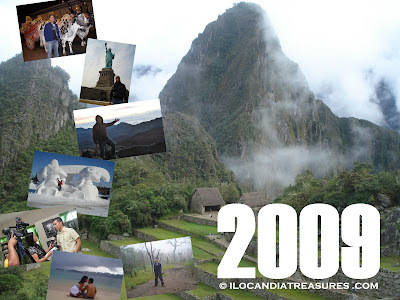 One major travel I made was my trip to the Americas. I was able to go around North America, Central America and South America in the first quarter. I visited one of the Seven Wonders of the World, Machu Picchu in Peru. I visited my former classmates from elementary, high school and college. I also visited some of my friends from the exchange programs I have participated in Japan such as the SSEAYP and REN programs. I stayed with some family friends and a former intern. I started my stint in mountaineering with the Laoag Mountaineering Group headed by the bishop. I had my induction climb to Mount Linao in Adams Ilocos Norte to which we were joined by the Ayala Mountaineers. On the same year that we also climbed Mount Bulusan in the province of Sorsogon. I had also visited Machu Picchu in Peru and Haleakala Crater in Maui Hawaii. I covered several festivals with the newest Kurarapnit Festival and Gameng Festival. I had a dose of all the local festivals in the province during the Ragrag-o Festival in celebration of Ilocos Norte foundation anniversary. I have seen an international festival that was Folklorica Festival in Costa Rica. Caramoan Peninsula was great treat and new discovery for me this year. It is truly a wonderful sight that is why Survivor reality show from France, Bulgaria and Israel were lured by her charm that they came here to shoot. 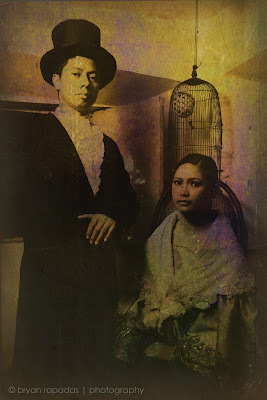 Started my affiliation with The Ilocandia Photographic Society better known as TIPS with photo shoots and exhibits. I was able to bring our photo exhibit at the University of Hawaii while I presented a paper in the Nakem International conference. Lastly, surprisingly I was invited for a talk at SASMA in Tagaytay to seminarians about backpacking and traveling. The Philippines was a colony of Spain. During the Spanish occupation, Spaniards have greatly influenced the country. Colonialism is a certain set of unequal relationships between the colonists and the indigenous peoples. Sovereignty was taken away from the people. The social structure, government and economics were changed by the metropole or mother city of Spain. It was not only in the culture but significantly influenced the people towards religion and thereby introduced Christianity. My group, The Ilocandia Photographic Society (TIPS) went on a seminar workshop in the city of Vigan. This place is being declared as UNESCO World Heritage Site because of the presence of preserved Spanish colonial houses in a cobbled-stone street. We conducted model shoot at the Heritage Village and at the Arce Mansion where I acted also as a model and joined some of the lady models of the Tropica Ilocandia agency. We were lucky to have been invited by Lito Perez, owner and designer of Camp Suki, a largest resource of costumes, to shoot photographs of models wearing the said costumes. Camp Suki is being housed at Arce Mansion, a bahay na batu. This creates the environment of 19th century. It is fully furnished with antique furniture from tables with all the silver cutleries, cabinets, and chairs and of course the chandeliers with the manual ceiling fans. It was a restored colonial house that it has three large rooms. The collection of costumes and the dressing room is located at the first floor. We had a hard time choosing what to wear because they are all so fabulous and it is a large collection. 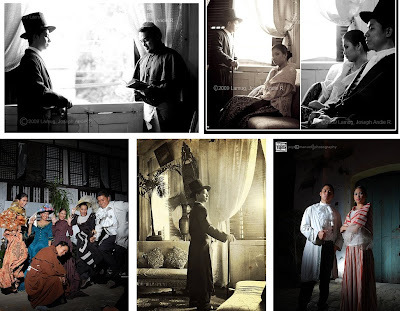 So when you are at Arce Mansion, it is reliving history where you can experience life in colonial Philippines by wearing the costumes and feel like the Dons and Senoritas of the colonial period. Of course, the main feature is the Maria Clara look where Perez took twists on it by experimenting on texture and treatments and created that Pinoy look. To come here you will have to arrange in advance. To experience the wearing of costumes, take photographs and have dinner with a group, a reasonable amount of fee is charged per person. Camp Suki was formerly called Sagwan and I have been hearing this from some friends I had long been wishing to get this colonial experience and now it was fulfilled. The main photo here with model Sallie was shot by Bryan Rapadas. The photos in the collage are from Andie Lamug, Ferina Albano and other TIPS members. Calamay is a popular delicacy in many regions of the Philippines. 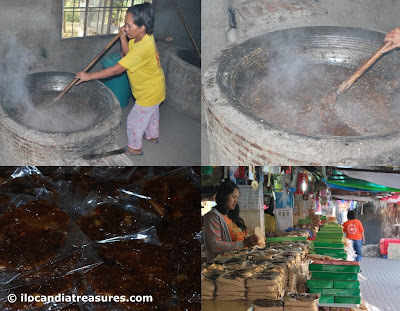 It comes in many variations and types but basically this is a sweet sticky delicacy made of glutinous rice, grated coconut and brown sugar. 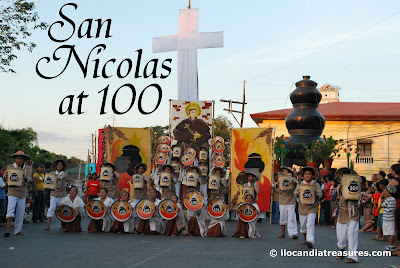 This is what the calamay of Candon City in Ilocos Sur is made up of. 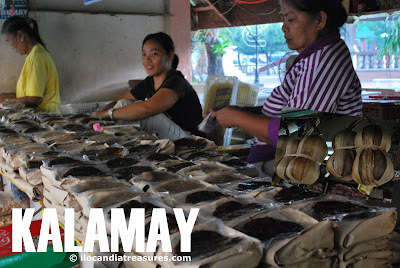 The regular calamay is brown in color because of the brown sugar or molasses. It is thinly flattened in round shape. They have another variety that is the white calamay which is made up of ground glutinous rice cooked in coconut milk and white sugar hence giving the white color. They also packaged it in a coconut shell with the husk and hang it at the stalls of the vendors. Before I went to the festival, I talked to some of the vendors at the plaza and explained to me how they make it and they later requested me to go to the barangay of Bagar to witness the actual making of the calamay. I met Caridad Dario, a pioneer in the kalamay business who owns the Caring Candon Food Product, showed me how to cook the calamay from the grating of coconut, grinding of the glutinous rice, to the continuous mixing of the ingredients in a wok over a continuous fire to packaging of these one by one. It should be placed on a plastic wrapper while its still hot so as not to stick. They gave me some freshly cooked calamay to eat. I was instructed to roll it first before eating to prevent sticking. I was surprised that Nana Caring gave me a pack of calamay to take home. 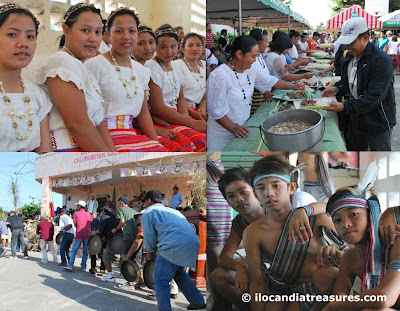 There was a food festival that was showcased during the Begnas Ylocos Festival at the cultural center in Candon. I was lucky to have been the very first person to try all the recipes that they created using some of the indigenous or local ingredients. For the main dish, of course very exotic was the frog and they had it curried. Adobong ginataang igat or eel was also good placed in a banga or pot. I also tried arroz alilem which is a version of the arroz valenciana. They also had ginataang tilapia with aba or yam. On one plate was the rellenong kippi or crablets and the grilled catuday. Pansit butong was made of young coconut. Inabraw cardis was another vegetable dish. I was amazed to find out that most parts of the banana tree was used in their recipes such as the sabunganay balls with sweet and sour sauce. This is actually the banana blossom which was minced and formed into balls and was deep fried. 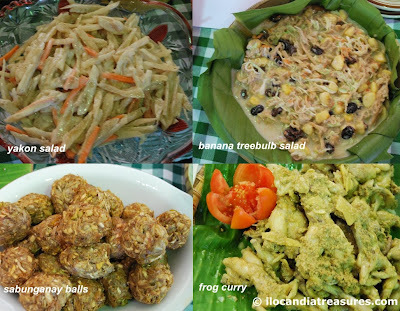 Another recipe was the banana treebulb salad. The treebulb was grated finely and squeezed to remove the juice and added condensed milk, cream, raisins and corn kernels. Another entrée was the yakon salad. For the desserts, they prepared kamote cupcake, steamed cassava, sinuman and imbagkal or biko. The dishes were all yummy. This was an exciting gastronomic experience. Despite a hectic schedule documenting one festival after another, I still managed to go to Candon City in Ilocos Sur to witness this special celebration by the indigenous peoples of the province. 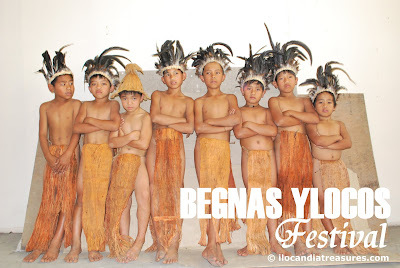 This is their second year to celebrate and hold Begnas Ylocos Festival after several postponements. This program was spearheaded by Governor DV Savellano and Board Member Tudayan who themselves are members of the Bago tribe. It is a big gathering of the various tribal groups in the province which include Tinguians, Kankanaeys, Bago, Isneg, and Igorots to name a few. Begnas, an Igorot word that refers to thanksgiving or offering rituals. It’s their way to celebrate and give thanks for all the blessings they received the past year. 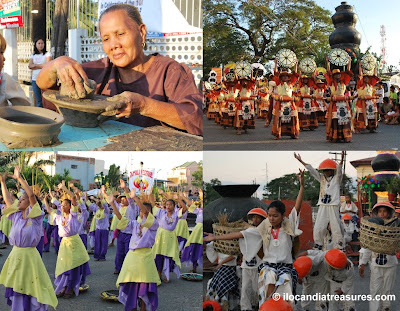 This festival has the purpose of promoting the identity, heritage and customs and traditions of the indigenous people of the province of Ilocos Sur. The first part of the festival was the authentic traditional practices being showcased that started very early in the morning held at the town of Galimuyod. I missed some of the activities there to which I was not informed in advance. I watched a few tribal dances at the plaza and met Mayor Jessie Balingsat. I joined the people take breakfast using fresh barks of banana and simply used bare hands, the traditional way of eating. Then we all moved to Candon at the cultural center for the exhibition of cultural dance showdown. I met most of the young participants there while they were busy preparing themselves donning their indigenous costumes. Pasuquin is categorized as a fourth class municipality in the province of Ilocos Norte with farming and fishing as its main industries. It is composed of 33 barangays that covers a land area of 210.54 square kilometers inhabited by around 26, 500 people. This town is noted for its rich history and colorful culture as the people celebrates several festivals annually. Sunflower Festival is among them. It is one of the popular festivals in town because it was made into an American film entitled Sunflowers in the year 1997. It was featured in various film exhibits and queer film festivals. The film made the festival event internationally known. Sunflower festival is an annual drag pageant where a group of gay men organize this event. From preppies to draq queens participate in this festival. They all call themselves as sunflowers. Most of the members are professionals and businessmen. Pioneers and founders of Sunflower are already residing abroad mostly working as doctors and nurses. I was able to meet and talk to the very first Sunflower queen who is based in Canada and now a retired nurse. He only went home to attend this glamorous Sunflower festival. He said that this is a way to promote their rights and assert now equality because most of them are educated. This is also to signify their contribution to the community. The pageantry became controversial because it was part of the Santacruzan, an event during the month of May to pay tribute to Saint Helen. A procession of images of saints was usually incorporated in the Sunflower festival. The Catholic church protested against the use of the images in the promotion of homosexuality as what I have heard. Therefore the images were no longer used today. 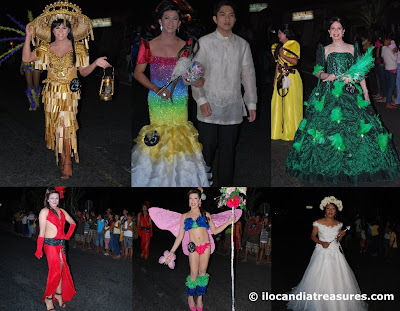 It was even moved on a later date not to overshadow the real Santacruzan. It is now being held in the month of December. Members of the Sunflower organization help each other put up this event. They hire their fashion clothes and escorts. They also produce lamp and lanterns to light their way on the street. They usually start the ‘royal’ procession at around 9 pm walking towards the plaza and hold a pageant show. They decorate the stage, floats and archs and create folk dances and programs.